I’ll be clear right from the start – I do not like boxing. I do not consider it a sport. Let’s face it, if you were to go out into the street and start punching someone in the face and torso repeatedly, the police would most likely get involved. People would be charged with all manner of offences including GBH, assault, and generally causing a disturbance. So why is it any different when two boxers step into the ring? Why is the law suspended simply because two people are surrounded on four sides by rope, with people cheering and a bell ringing to mark off 3-minute intervals? The object of this so-called sport is to beat your opponent so badly that they fall to the ground, possibly unconscious, and are unable to get up to defend themselves any longer. Does that sound like fun? If it happened to you on the street, would you consider it sporting if your attacker stopped once you couldn’t get up again? Knocking a person unconscious or even causing concussion may cause permanent brain damage. There is no clear division between the force required to knock a person out and the force likely to kill a person. 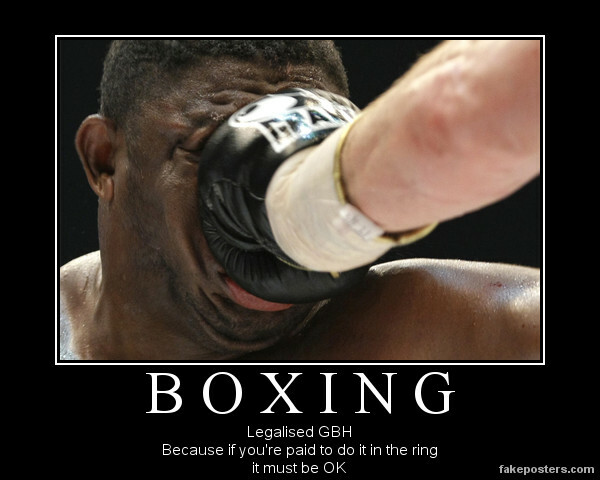 Since 1980, more than 200 amateur boxers, professional boxers and Toughman fighters have died as the result of ring or training injuries.Thus, in 1983, the Journal of the American Medical Association called for a ban on boxing. It seems to me, this is the last of the gladiatorial “sports”, with the masses baying for blood and betting on one man’s ability to knock another man senseless, possibly causing brain damage (among other more visible, injuries). I cannot understand why, in this modern and supposedly enlightened age, this barbarity continues when it is nothing short of legalised brutality. I’d be interested in hearing your point of view, whether you agree or disagree. Please leave a comment below and, if you post on your own blog, please leave a link to your Soapbox Tuesdays post! This entry was posted in Commentary, Memes, Soapbox Tuesdays and tagged Boxing, Commentary, Domestic Goddess, Memes, Soapbox Tuesdays, Sport. Bookmark the permalink.